This congregation was still active in 1974, when they held their centennial, but I don’t know when it disbanded, nor do I know when the fire damage that partially gutted the roof occurred. Ezekiel New Congregational Methodist, as well as the old Ruskin Church and the old Trinity Methodist in downtown Waycross (now demolished) are, in my opinion, all the work of the same builder. J. Gregory Smith writes: Once as a child, I marveled at a 10 foot rattle snake that was hung on a pole on the highway in front of the church. My grandmother, Mina Jordan Smith once ran a filling station and grocery in Dixie-Union . In later years. my cousin Twiman Smith ran a store just down the road.Good memories!! Leigh Nelson shared this wonderful historic photo, likely made during a revival or homecoming. She is unsure of the date but some of her relatives were part of the congregation. Do not share without credit to her. Thanks to Anna Gay Leavitt for helping me locate this church. As the story goes, my great grandparents were married in this church. I have some old pictures of the church somewhere as well that I will try to find. Drove past it all my life growing up and looking back I wish that I would have taken more pictures. It was restored at one point but then later abandoned. I believe this church was located on the north bound side of RT #1 between Waycross and Dixie-Union. I took a picture of the church before and after the fire while on my summer visits to my grandmother’s home. Once as a child, I marveled at a 10 foot rattle snake that was hung on a pole on the highway in front of the church. My grandmother, Mina Jordan Smith once ran a filling station and grocery in Dixie-Union . In later years. my cousin Twiman Smith ran a store just down the road.Good memories!! It is good to see the photos that will remind us of all the history we have lost. 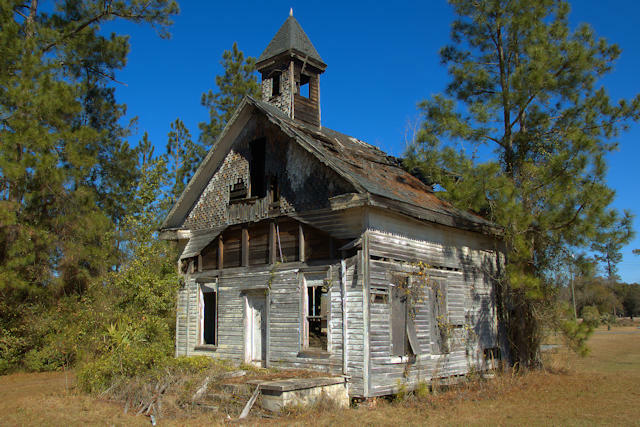 that almost looks like a schoolhouse with that top belfry. This is a beautiful little building. 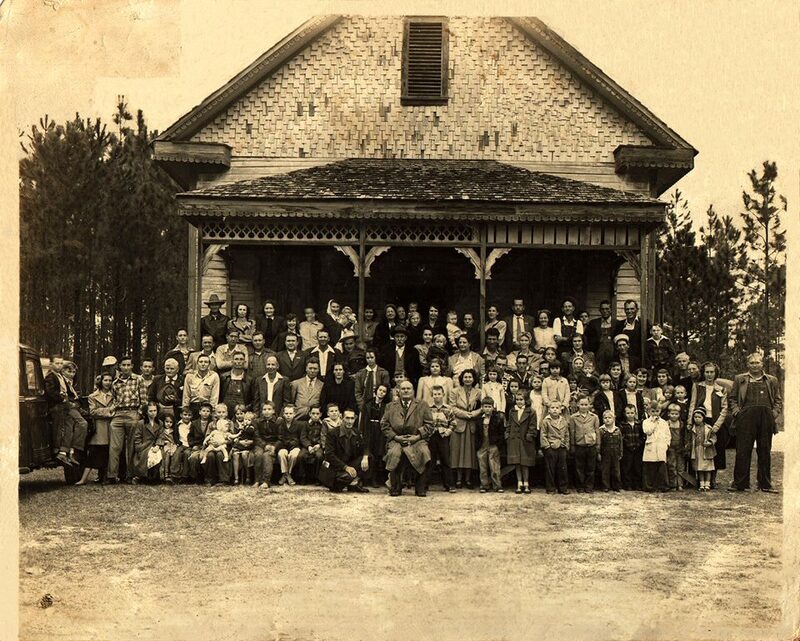 There is a large frame church in Waycross – I have some photos somewhere – that has similar elements. I’ll try to find. They are recent. Is the church located IN Waycross, Chip? It could be the one I thought was demolished…I know the Ruskin church is almost a carbon copy of this one.